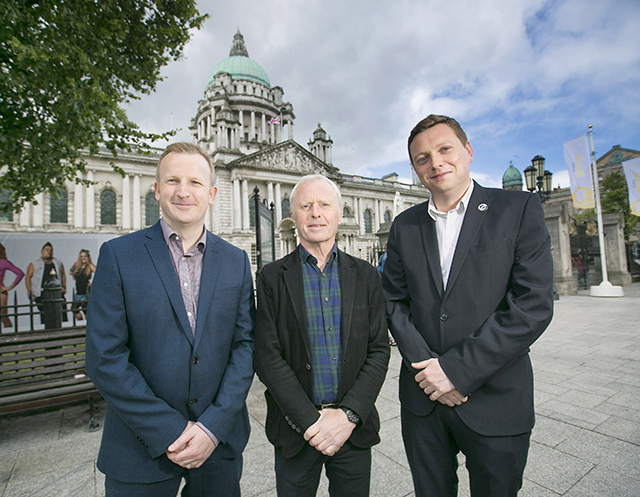 Image: Pictured launching the initiative are David McConnell, Arts Council of Northern Ireland, Bill Wolsey, Managing Director, Beannchor and Councillor Donal Lyons, Belfast City Council. The Arts Council of Northern Ireland and Belfast City Council have today, Monday 25 June, launched the Resilience Programme, an 18-month development initiative aimed at supporting large-scale Belfast arts organisations adapt and change as the city grows. The Resilience Programme has been jointly developed by Belfast City Council and the Arts Council of Northern Ireland through its National Lottery funds. The programme will work with a number of Belfast-based arts organisations that have city-wide reach and only those organisations that are in receipt of Arts Council of Northern Ireland Annual Funding and Belfast City Council Core Multi-annual Funding (CMAF) are eligible to apply. Participating organisations will benefit from a customised support programme including one-to-one coaching, masterclasses and peer learning. Arts organisations will then develop a change management plan to help them identify new opportunities for future development. Financial assistance may also be made available to support organisations as they implement their new plans. The Resilience Programme is delivered by Full Circle Management Solutions and is now open for applications and will close on Friday 31 August at 12 noon. Visit www.fullcircle.eu.com/resilience-programme for further information on how to apply.